Start off your visit on the 16th (Sat): appreciate the history behind 9/11 Memorial. On the 17th (Sun), you'll have a packed day of sightseeing: explore the landscape on two wheels at Hudson River Greenway, explore the world behind art at The Metropolitan Museum of Art, and then take in nature's colorful creations at Hallett Nature Sanctuary. For more things to do, where to stay, ratings, and tourist information, go to the New York City online driving holiday planner . Geneva, Switzerland to New York City is an approximately 12.5-hour combination of flight and bus. You can also fly; or do a combination of train and flight. The time zone difference moving from Central European Time to Eastern Standard Time is minus 6 hours. Expect a daytime high around 11°C in March, and nighttime lows around 1°C. Finish your sightseeing early on the 19th (Tue) to allow enough time to drive to Las Vegas. Your cultural itinerary includes sights like The Strip and The Mob Museum. Get outdoors at Red Rock Canyon National Conservation Area and Escape Adventures and Las Vegas Cyclery. It doesn't end there: identify plant and animal life at Lake Mead National Recreation Area and ponder the design of Bellagio Fountains. To find traveler tips, photos, maps, and more tourist information, read our Las Vegas journey planner. Traveling by car from New York City to Las Vegas takes 41 hours. Alternatively, you can take a train. The time zone difference moving from Eastern Standard Time (EST) to Pacific Standard Time (PST) is minus 3 hours. While traveling from New York City, expect warmer days and somewhat warmer nights in Las Vegas, ranging from highs of 27°C to lows of 13°C. Wrap up your sightseeing on the 24th (Sun) to allow time to travel to Los Angeles. Your cultural itinerary includes sights like The Getty Center and Hollywood Forever Cemetery. Griffith Observatory and Los Angeles County Museum of Art will appeal to museum buffs. Change things up with these side-trips from Los Angeles: Santa Monica Mountains (in Santa Monica) and Oak Canyon Nature Center (in Anaheim). And it doesn't end there: stroll through Venice Beach and Boardwalk, take in the waterfront at Santa Monica Pier, admire the striking features of Italian American Museum of Los Angeles, and stroll the grounds of Pierce Brothers Westwood Village Memorial Park. To see where to stay, ratings, and other tourist information, go to the Los Angeles route builder tool . Getting from Las Vegas to Los Angeles by flight takes about 4 hours. Other options: drive; or take a bus. 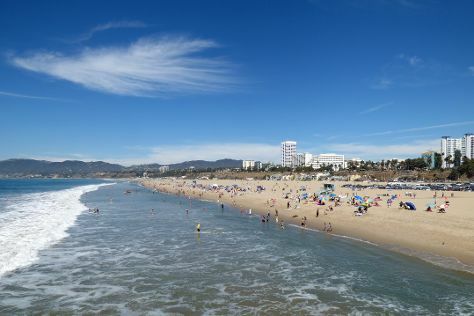 In March, daily temperatures in Los Angeles can reach 27°C, while at night they dip to 14°C. Cap off your sightseeing on the 26th (Tue) early enough to travel to San Francisco. Start off your visit on the 27th (Wed): examine the collection at Cable Car Museum, engage your brain at Exploratorium, and then step off the mainland to explore Alcatraz Island. Get ready for a full day of sightseeing on the 28th (Thu): examine the collection at de Young Museum and then enjoy the sand and surf at Fort Funston National Park. For reviews, where to stay, maps, and other tourist information, use the San Francisco driving holiday planner . You can fly from Los Angeles to San Francisco in 4 hours. Alternatively, you can do a combination of flight and train; or drive. Traveling from Los Angeles in March, you will find days in San Francisco are slightly colder (21°C), and nights are about the same (11°C). Finish your sightseeing early on the 28th (Thu) so you can travel to Los Angeles. Kick off your visit on the 29th (Fri): learn more about the world around you at La Brea Tar Pits and Museum and then admire the majestic nature at Santa Monica State Beach. To find traveler tips, more things to do, other places to visit, and more tourist information, refer to the Los Angeles trip planning website . You can fly from San Francisco to Los Angeles in 4 hours. Other options are to do a combination of train and flight; or drive. When traveling from San Francisco in March, plan for a bit warmer days in Los Angeles, with highs around 27°C, while nights are about the same with lows around 14°C. Finish up your sightseeing early on the 29th (Fri) so you can travel back home.